I saw this on a friend's facebook wall last week & immediately knew it needed to be shared. 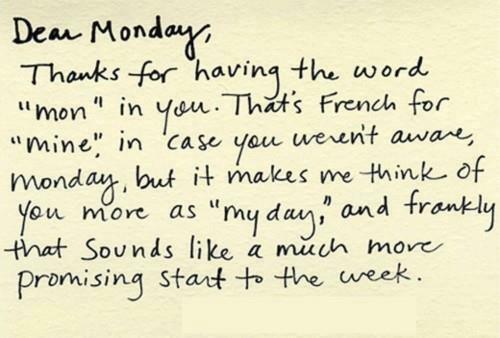 We all suffer through Monday-itis every single week, but seeing this, learning that "Mon" actually meant "my day" gave me an idea - turning it from my least favourite day of the week, in to one of my favourite day's of the week. How could I not? The word Monday means 'My day', which, by any definition, means I should be celebrating it, not dreading it. So here's the thing. I want you to remember this from this day forward. That every Monday, you have permission to love it, it's my day, your day, OUR day...relish in it. Do something you love - take a bath, 10 minutes sitting in the sun, eat some cake, read a gossip magazine, light some candles around the house ... do whatever it is every Monday to make YOUR day special. Today, I am in Prague currently falling harder & harder in love with this beautiful city. For 'my day' I have plans to climb up Petrin hill & visit the highest point of the whole city, lounge around in the sun with my loved one on a comfy patch of grass, then stroll back down in to Old town to divulge in some coffee & cake. So Thank you Universe - for giving us all 'our day' Monday. What are YOU up to on your beautiful Monday? Well LUCKILY it was a public holiday here so I got to do all the things I love like beach hangs at Swanbourne, lunch at The Naked Fig, then swim near Hillarys with another friend and then a family BBQ.